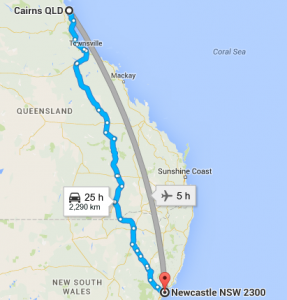 Planning your move from Cairns to Newcastle can be cumbersome, let alone the move itself. However, with a professional interstate removals company like Roadways Furniture Removals at your service, moving from Cairns to Newcastle is easier than you think. Roadways is a trusted and reliable packers and movers company in Australia with a strong industry presence of many years. Cairns to Newcastle removalists offer professional furniture removals services to people relocating to and from major cities and towns in Australia. If you are looking for high-quality interstate removals services at cost-effective rates, Roadways ought to be your choice! Pre-packing: Need an expert to pack your belongings? Roadways provides professional pre-packing services; we pack from large and bulky to small and light furniture and household items. Our dedicated team of packers will arrive at your house days before your moving date to do all or some of the packing for you, depending on your needs. Moving Boxes: We provide safe and durable moving boxes to reduce the risk of damage to your belongings. Our boxes are designed to accommodate your household items and built strong for the long journey ahead. Interstate Backloading: We ensure your furniture arrives safely at your new house in Newcastle and in the same condition it was in, in your Cairns home. The moving trucks are designed to protect your items from damage. Our backloading professionals are experienced and knowledgeable and take utmost care when handling your belongings. Vehicle Transport: Need to transport your car or bike from Cairns to Newcastle? Try our interstate vehicle transport service. We ensure absolute safety and timely delivery of your vehicle, either to your new house in Adelaide or one of our depots in the city, depending on your choice. Piano Removals: Whether you have a small upright piano or a concert grand, we have specially designed crates and trolleys to handle all kinds of pianos. When you entrust Cairns to Newcastle removalists with the responsibility of transporting your piano, or other precious items like pool tables, priced paintings, antique collections, etc, to Newcastle, we make sure they arrive at their new home, undamaged. Roadways ensures the complete safety of your furniture as we are the best Cairns to Newcastle removalists. So call Roadways today and experience a hassle-free relocation to Newcastle!